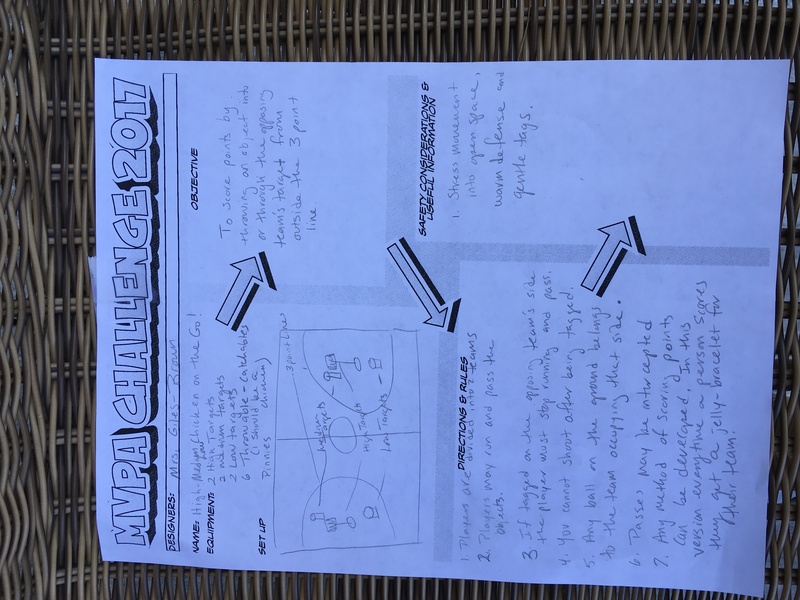 The fitness unit I designed in 2017 for my middle school students was titled 2017 MVPA Challenge. My idea was to develop a unit in which students would have opportunities to participate in individual fitness challenges and group games/activities designed for all participants to engage in high levels of MVPA while building targeted fitness skills and knowledge. The basics for the design are linked below in my MVPA Unit Planner. I also included the template I use when brainstorming for a new unit. After I sketched out my ideas, I created the scale that we would use to track progress and be kept in student portfolios. I would need to create the assessments and any assessment resources that I would be using. As you can see in my planner, students would be designing MVPA Games so I needed a template for them to use and for me to use in order to provide examples for students. I would also need to create the fitness knowledge review/study sheet and the end of unit quiz. 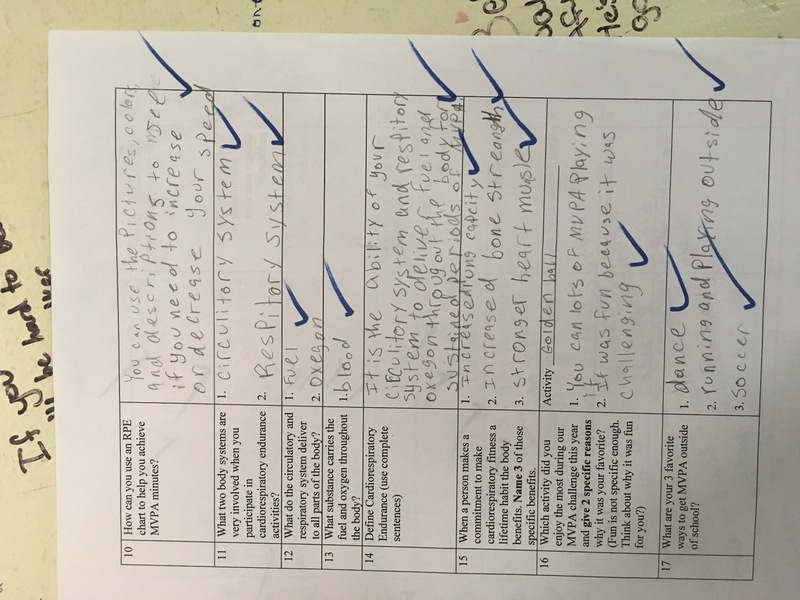 I planned to use a turn-to routine of formative assessment techniques at the end of each class period, pulling questions from the learning targets and unit visual. Routines and rituals designed to include content and help us use class time efficiently were set up and practiced at the beginning of the year. Below are those that were already in place and would be used during this unit. ​My students come through the door, read a small white board I have at the entrance with instructions for starting class. The routine previously set up consisted of students setting a character goal, telling me, and starting a dynamic warm-up consisting of movements in all 3 planes of motion. Students have the choice of working on their own or moving with others. This routine would remain the same with addition of getting & setting pedometers after the first lesson. I find this works very well as students trickle in from other classes. It also gives them practice following a series of written directions. Once I see that everyone has arrived and has had a few minutes to warm-up I start the lesson. This is the cue I use to gather students to "connect" to whatever we are focusing on for the day. Most days this follows an instant activity that comes right after the dynamic warm-up. The instant activity is designed to engage students, manage emotional states, activate prior knowledge and access neural networks associated with the day's lesson. The memory circle we had in place for our "connect" was set at the beginning of the year and was created to thread the basics of memory and learning into each unit and the scale I wanted to put in place this year to use for both self, formative and summative assessment. On this cue, students again return to a designated space for a lesson closure planned specifically for the lesson. This routine is well established and quickly carried out allowing time for formative assessment, a class debrief or some other method of class closure. I'm not going to outline every lesson but this description along with other sections presented here should provide a good idea of how the unit started and progressed. During the first lesson of the unit (right after the dynamic warm-up) I planned a fun tag game that engaged students immediately in MVPA. Then I presented the big idea and unit question on the flip chart. I didn't talk a lot about it but did ask them to think about it and be ready to share some ideas at our next class meeting. We would add their ideas to the visual then. We got the pedometers out and reviewed how to wear, reset and read steps, activity time and MVPA time. We worked through an activity where I challenged students to move in a variety of ways and in a variety of simple activities/games getting them used to wearing and reading their pedometers. Each time we started a new challenge/activity/game they were to reset their pedometers and I started my stopwatch. When I paused the activity I stopped my watch and students checked their pedometers to see if they matched my time for activity time and/or MVPA time. This experiment guided students to figure out what intensity they would need in order to reach the goal of MVPA time. At this point we connected our experimentation with the RPE chart. (Thanks to Naomi Hartl for this one. )This would be the method we would use throughout the unit with a variety of individual challenges and group games/activities with the goal of students coming as close as they could to the time on my watch with the MVPA time on their pedometers. This proved to be very motivating for my students. 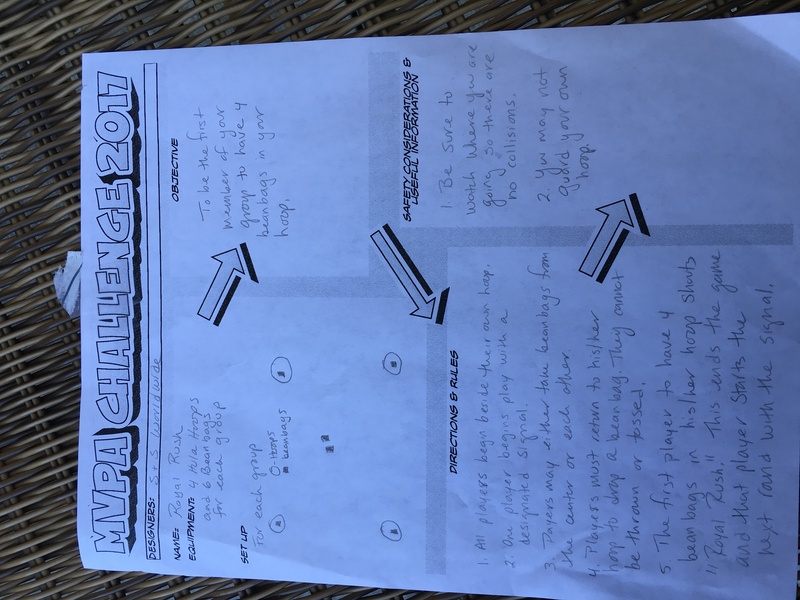 The components of each lesson during the bulk of the unit involved students participating in an individual MVPA challenge and a group activity/game MVPA challenge. The unit would culminate with students creating MVPA games/activities and testing each one with pedometers as we had throughout the unit. We moved through the unit in this manner, each day increasing the time for the individual MVPA challenge followed by an MVPA game challenge, adding information and discoveries to our visual when connecting and reflecting. Once everything was set up, students entered, reset pedometers, started dynamic warm-ups, moved into the individual MVPA fitness challenge for the day, connected to the visual and learning targets for the rest of the lesson, moved from there into a group MVPA game/activity, and then gathered for reflection and formative assessment. 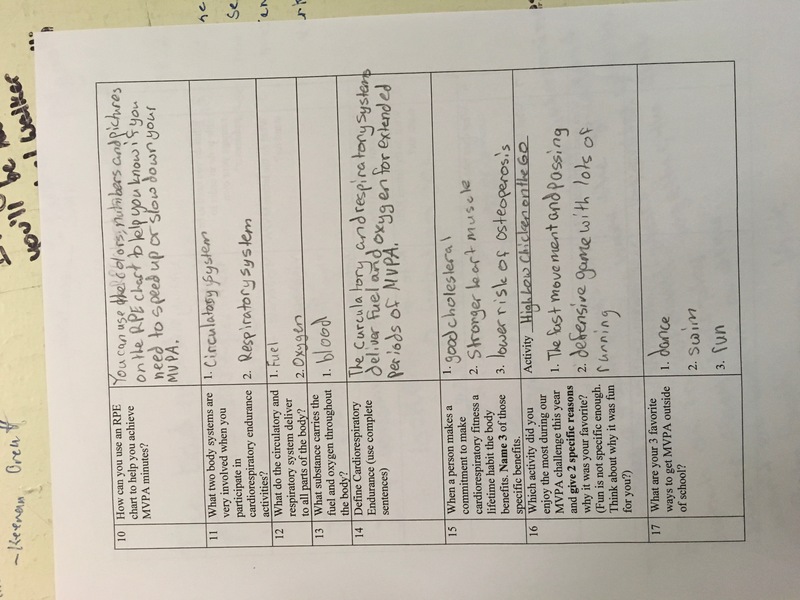 During the course of the unit we integrated all of the fitness knowledge outlined in the student review sheet and we learned to use the RPE chart that was posted. 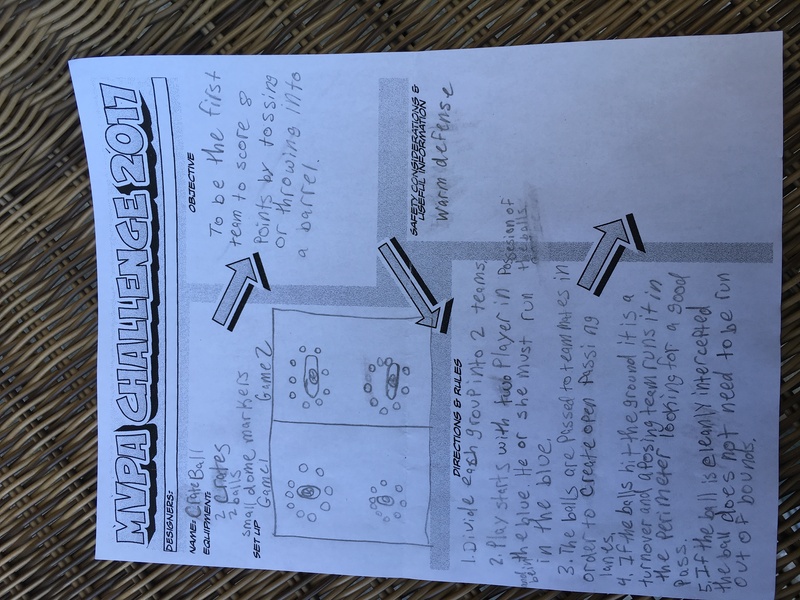 When it was time for students to design their own MVPA Games I wrote up three that I had presented during the unit as a formatted example for students to use as they wrote up their own games. Each group or individual presented their game to the class to be tried and tested in the same way we had the activities I presented. The kids had a great time with this process. It also gave me a chance to revisit the skill of consensus decision making. One we had worked a lot on during the first unit of the year. During our games of invasion unit students worked extensively to develop the ability to work in small groups to learn a consensus decision-making process. I use the acronym CSSC which stands for CIRCLE-SHARE-SUGGEST-CONSENSUS. When posed with a problem to solve or decision to make students gather in a circle with no equipment and do a share one time around the circle with the goal of no interruptions or judgements. After the share the facilitator might start the suggestions based on what was shared or he/she might call on someone who indicates he/she would like to start. Facilitators listen carefully and at some point will say something like, "It sounds like the group wants to... (then summarizes a plan). Can we see if we have consensus." We use the typical thumb signals to indicate where people are. The scale I use for student to track their progress is linked here. Choice changes brain chemistry and I have found that purposefully building it into a unit will almost always create a more favorable experience for everyone. For each individual MVPA challenge students had choices in terms of what they would do. I set up a variety of equipment such as hurdles, agility ladders, jump ropes, steps, etc. around the room. Students could choose to use equipment, jog, power walk or do a combination of any or all for the designated time as the attempted to match my time for MVPA. As we worked through the unit the time increased gradually and topped out at 10 minutes. I use Gopher's FITstep Pro Pedometers which measure steps, activity time and MVPA time. One of the features I like about this is the ability to choose the number of steps per minute it can be set at. For the first few lessons of this unit I had everyone set the MVPA step measurement at 110. After that, I introduced the choice of setting it at a higher rate for an increased challenge. I had some students who opted to play with that number, setting it at 120 or 130 for a few class periods in order to experiment and challenge themselves to move more vigorously in order to meet the MVPA challenge for the day. Some went back to the 110 but I had a few that opted to go for higher numbers during each class period. When we got to this portion of the unit students would have a choice as to whether they wanted to work alone or with others. We explored the challenges of working in large groups as opposed to groups of 2 or 3 students. I had one student who had an idea he wanted to pursue and opted to work alone. His game ended up being one of the favorites. We had some discussions about how individual choice of intensity during the group activity or game affected how enjoyable it made the game for others. These were some good discussions. I wanted a way for students to actively review and think about the benefits of making moderate to vigorous physical activity part of every day. 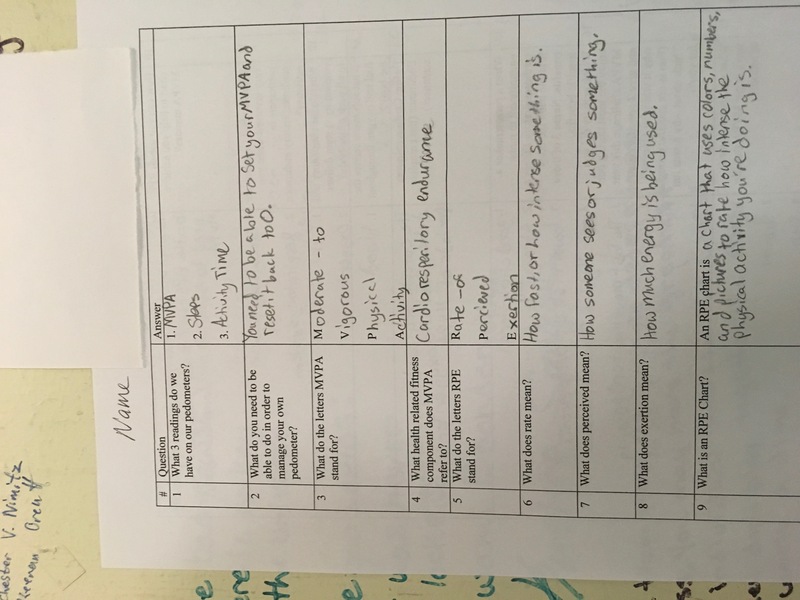 I created a think-draw worksheet for students to use as they learned and reviewed the benefits of making MVPA part of their day. I used this for a few minutes during some of reflection times. Students visually represented each of the items listed in the boxes. I would take 4-5 minutes, put some soft music with no lyrics on in the background and just start talking. Students were silent in our circle with the colors of their choice and they just drew what they were hearing and thinking about. This method contributes to helping students move information to long term memory. More ideas like this can be found in Physical Education Assessment Toolkit. Many physical education teachers have used active versions of rock-paper-scissors with their classes. I often use this in combination with review of vocabulary and concepts included in a unit of study to create an active review. The process I use is as follows. All students begin in one corner of the room armed with the Rock Paper Scissors Review & Study Sheet. They each begin with one partner and play rock-paper-scissors. The player who wins gets the first choice - to ask or receive. The first person to ask chooses a question from the sheet while his/her partner hides his/her sheet behind his/her back. If the question is answered correctly partners reverse roles. Play continues until someone answers incorrectly. The partner asking the question must reply by giving the correct answer. Then he/she runs to the next corner to find a new partners. The other partner stays on that corner and plays another person or he/she can power walk around and study in the center of the room before returning to the same corner to play again. The first time we play there is a lot of running. I can tell when students are building a stronger foundation of knowledge when games last for increasingly longer periods of time. I have shared this method with classroom teachers as it is a very simple way for them to get out of the classroom and "move their content." If I were teaching in a classroom I would grab a few cones, head outside and run an active RPS review. It could be beefed up even more by considering episodic memory strategies and always going to the same location for a specific subject or unit. 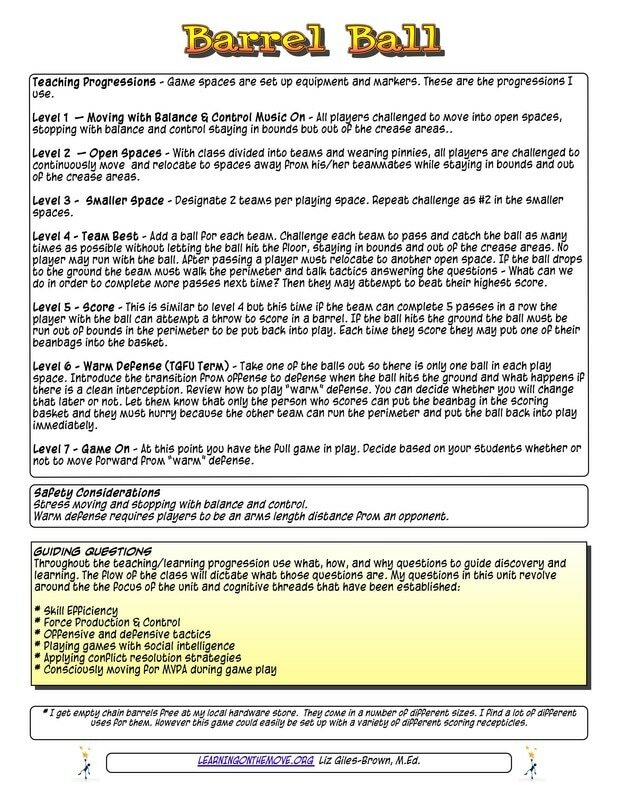 I have included links to the template I used for all MVPA game designers as well as the three games I wrote up using this template for students to use as examples as they worked to design their own MVPA games. 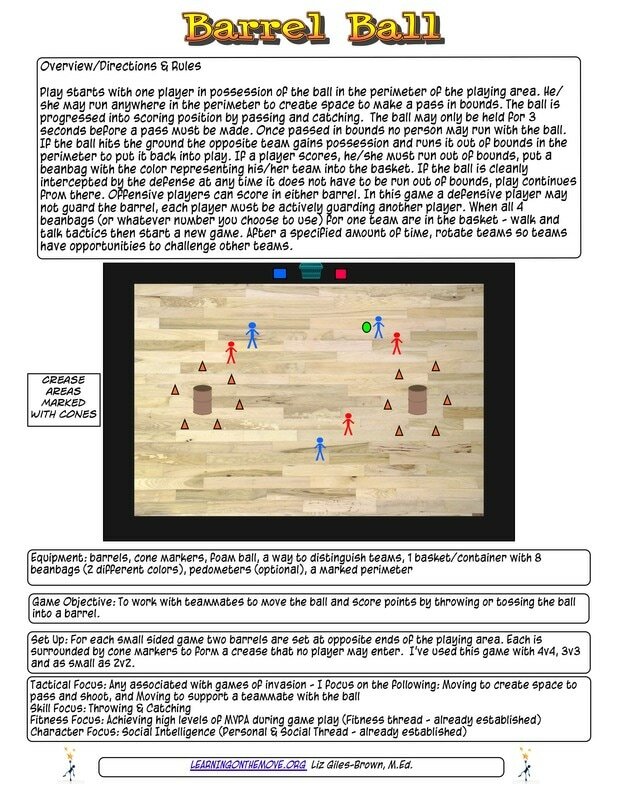 Below are images of the write up I did for Barrel Ball using the desktop version of Comic Life (Thank you to @CoachPirillo for recommending this version versus the iPad Application in his PhysEdSummit 3.0 Session Camouflaging Fitness. For me it is so much easier to use. If you click on the link just above you will be able to download the printable pdf version. 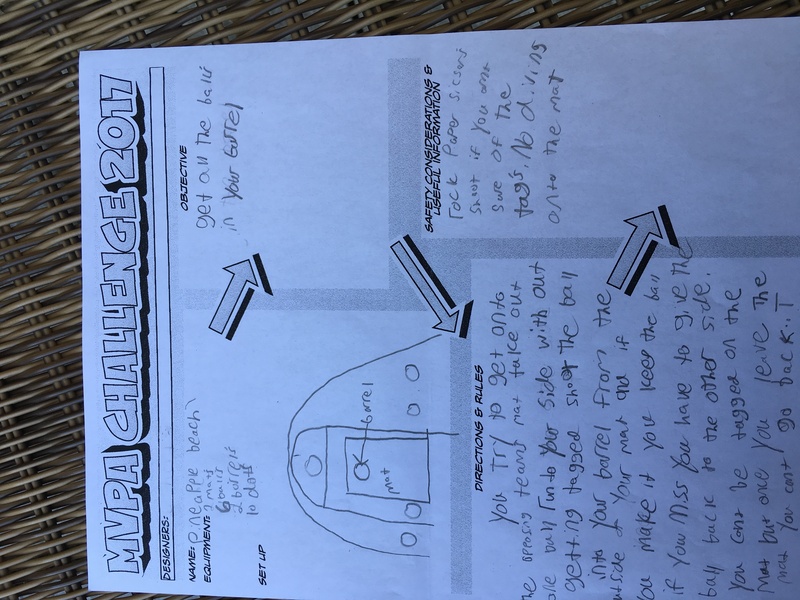 Here are a few of the student created MVPA games and completed quizzes. As I reflect on this unit there are some things that I would definitely do again and some things that I would modify or change. Here is a list of my thoughts. 1. Using pedometers is definitely a motivating factor with my students when it comes to the intensity of their participation. We wear them during most class periods. Students love checking them at the end of each class. They are easy to use and quite reliable as far as measurement goes. I'm finding students are setting personal step goals without my prompting. Yeah! I also like the fact that some students come in and immediately set the step MVPA count up to give themselves an additional challenge. 2. I loved the combination of individual challenges and group games/challenges. Students enjoyed this as well. 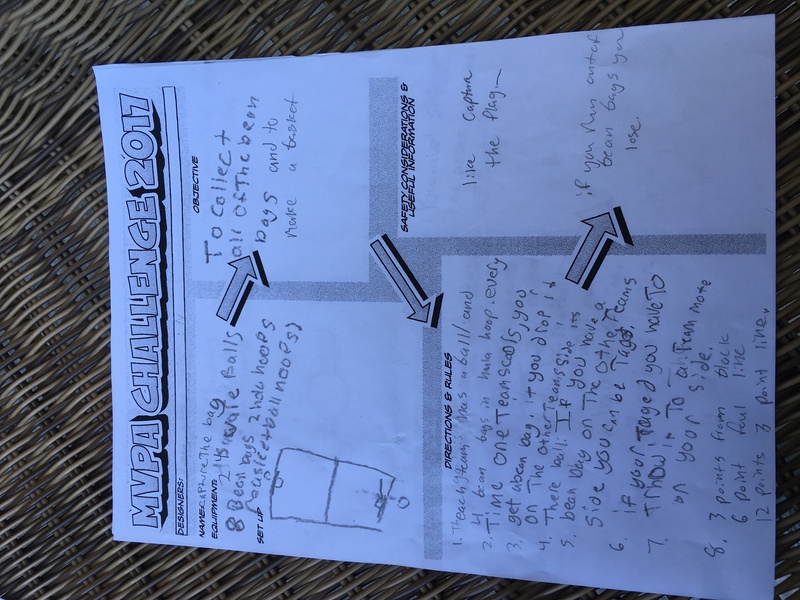 I was surprised to read that for some students their favorite was the individual workout challenge as opposed to the group games. It seemed to be a perfect balance. Having the gym set up with all the obstacles and activity apparatus for the individual challenge helped to use time very efficiently. Right after the dynamic warm-up time we transitioned very smoothly into the individual MVPA choice challenge. There was plenty of class time left to "connect," build our group activity/game, participate in that, and reflect/debrief. 3. Letting students choose to work alone or with others for MVPA game designs was worked very well. I do a lot of random groupings and a lot of purposeful pairings and students do well with that too but for this activity it was great to have them group themselves. This is based on a strong foundation of unity so any student wishing to join a group was welcome. It was nice to see my students practicing social intelligence in this setting. 4. Most of the games students designed tested with most participants able to achieve high levels of MVPA. There were a few that did not. It was good to talk about the fact that it doesn't necessarily mean that it's not a good game for other purposes but might not meet the goal of "high in MVPA." We built in a little time to talk about possible modifications and tried them a second time. 5. All the games were fun and students seemed to really enjoy them. 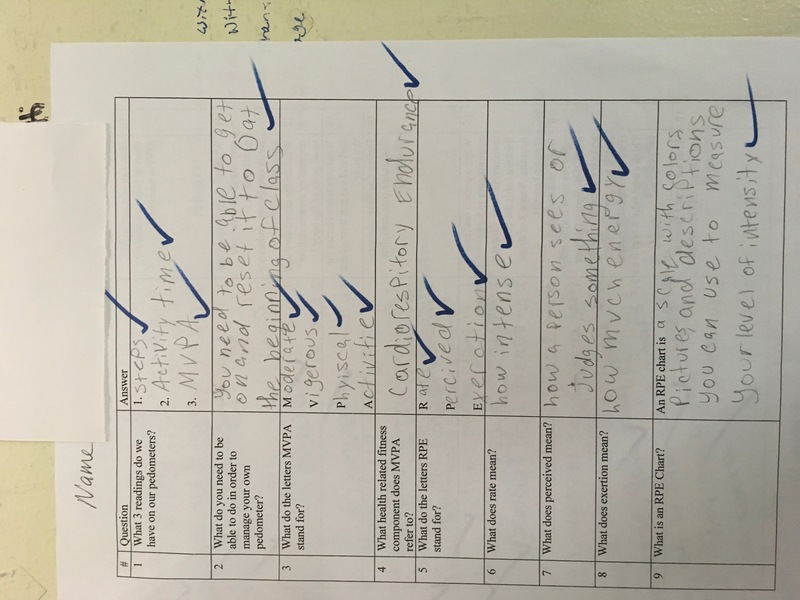 There were 3 that many identified as being a favorite way to get MVPA in physical education class when they competed the reflection portion of their quiz. One was my Barrel Ball and the other two were designed by student groups. I plan on taking some time to further develop those and type them up with modifications we made during class. 6. The game Barrel Ball came out of this unit and it's definitely a keeper. It will be great to use during a invasion games unit. It's a little bit of Tchoukball (two scoring areas on opposite ends of the playing space that can be used by the offensive team), a little bit of Ultimate (the ball can only be progressed by throwing and catching and if it hits the ground it belongs to the opposite team) with a creative transition twist that requires a player to run the ball out of bounds and use the perimeter to move freely and create open passing lanes to put it back into play. I love how this transition from offense to defense works. It's very clear and adds more movement. 7. I will create a different review sheet with a space for students to write and draw instead of me having the answers all typed for them. 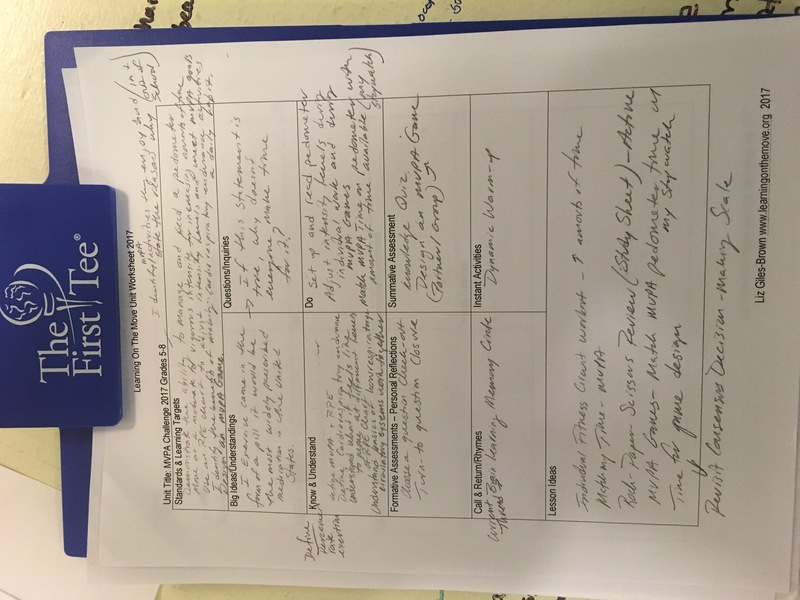 This would be a combination of the Draw It reflection sheet and the unit review sheet and create another way for them to practice and review the vocabulary and concepts. I'd like to create a template that can be used with other units as well. This will allow for more efficient use of time as students become more familiar with the process of using it. 8. The visual template I created for game designs using Comic Life yielded better more complete results than previous game design sheets I have used just using Word. I will use this type of visual design with other assignments in the future. 9. In the middle of this unit I happened to watch an archived #PhysEdSummit 3.0 session presented by Glenn Young on his ABC Fit program. I highly recommend watching and can see connecting some of the ideas presented next time I implement this unit. 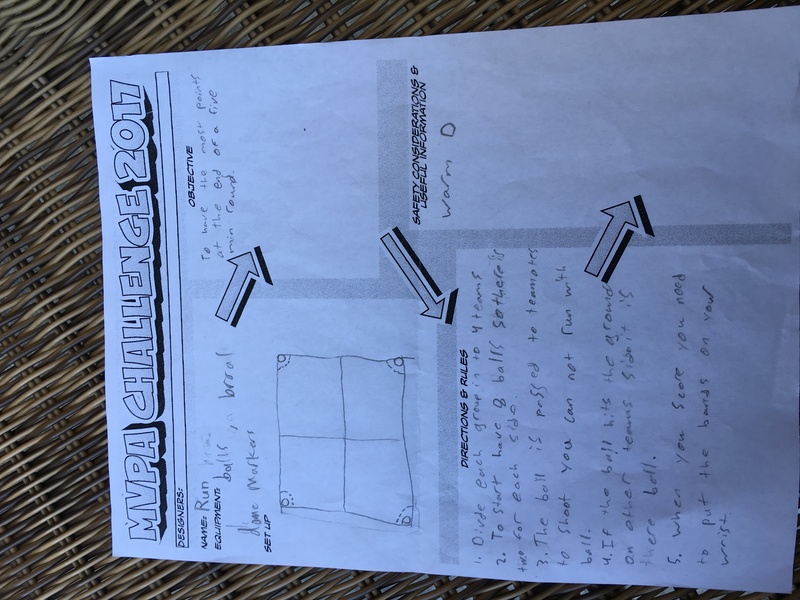 We had long since ended our MVPA Challenge unit and were in the middle of a pickleball/net games unit when at the end of class one of my 7th grade students said, "Hey, Mrs. Giles-Brown we made up an MVPA game at recess..." Naturally, my reply was to scream, "YEAH! Tell me all about it." They were a bit late for their next class.. but the time was well spent. Yes, the ultimate goal is transfer... for students to leave us and connect what they have learned to their daily lives. What could be better than that?